This entry was posted in General News, Meeting Minutes on April 11, 2019 by Custer Rod and Gun Club. – Action Pistol-Raffle going well for shed, 7 books sold, Chris sold over 5 books, USPCA shoot canceled. Tentative calendar 4/6, 6/1, 6/29, 7/6, and 8/3. Action pistol is starting May 2nd. – Shotgun- schedule will be posted soon. Resume Ladies Tuesday night shoots, other days are up to demand. 6) Old Business-Vincent said the shed will be delivered in April depending on conditions. This entry was posted in General News, Meeting Minutes on April 7, 2019 by Jeff Faycosh. This entry was posted in General News, Meeting Minutes on March 18, 2019 by Custer Rod and Gun Club. 1) Call to order and Roll call of officers-present Jesse Smith, Chris Schlepp, Jeff Faycosh, Marty Scheid, Shane Adams, JD Arneson, Todd Burch, Jim Keith and Vincent Muggli. 3) Reading of Current Financial Report-Marty reported cash balance of $35, 069.91, CD $2,321.99, pay pal has a little over $6,000. Jim moved to accept the report, Shane seconded, motion passed. – Annual Banquet-took in $6,165 in cash, $1,400 in Memberships, banquet costs of $1,492 which resulted in a first time ever profit for the annual banquet of approximately $1,400. – Membership-a little less than 400 members are currently paid. – Action Pistol-Custer Rod and Gun Club USPSA match to be held at Fallon County indoor range on March 9th. limited number of shooters allowed. It will be a USPSA classifier match. Vincent made the motion for the match, seconded by Marty, motion passed. Marty requested range supplies for action pistol for the year (cardboard targets, sticks and pasters) Jim made a motion of $500 for action pistol range supplies, Todd seconded, motion passed. Motion by Chris to purchase 40′ land/sea container to store range supplies at Sunday Creek action pistol for $5,000, JD seconded the motion, Vincent will find a container vendor. Marty made a motion for a raffle to pay for the container. $1,500 in gift certificates, limited to 100 tickets at $50 each. Motion was seconded by JD, motion passed. Marty will have raffle tickets by March meeting date. – Shotgun-Jeff is reaching out to ATA for league information. – Spotted Eagle Keys-Chris will coordinate with locksmith for lock changes. – $3,000 steel target budget for Action Pistol-Motion to approve email straw vote by Jesse, seconded by Shane, motion passed. – FWP Range Day-Jeff brought up Hunter Education field day at spotted eagle range on March 10th. Jim made motion to allow the use of the range, JD seconded, motion passed. – FNRA Committee-Shane requested volunteers for friends of the NRA banquet, contact Shane for more information. This entry was posted in General News, Meeting Minutes on February 20, 2019 by Jeff Faycosh. 3) Reading of Current Financial Report-Marty Scheid reported that the Bank Balance as of January 16, 2019 was $30, 582.16, CD at US Bank January 16, 2019 was $2,318.09 current rate is 2% and will mature July 3, 2019. The CD at Stockman’s Bank has been surrendered and check deposited. It will be converted to CD the following week at US Bank at the 2% rate. All monthly bills are paid, 2018 taxes are paid, all insurance premiums have been paid, still waiting on last of tax documents to file club taxes for 2018. Motion to accept, seconded and passed by membership. 4) President Report- 2018 showed 430 members, 2 work days (one at Sunday Creek the other at Spotted Eagle with 23 volunteers), Spotted Eagle remodel is nearing completion. – Action Pistol-very steady activity and the most active portion of the club currently Jess Blankenship and Marty Scheid spearheaded the activity this year. New targets and walls in place. New affiliation with USPSA along with Action Pistol. – Cowboy Action-Randy Hart reported slow this year but always willing to lend a hand and hope to have a three gun shoot this year if there is interest. – Shotgun-Weekly trap shooting last year, some interest is keeping the range open. Hoping to ATA league shoots in 2019 along with Women only clinic, youth shooting programs. – rifle shooting-JD Arenson hosted on 800 yard shoot this year, Jeff Faycosh and Chris Schlepp hosted a rimfire turkey shoot along with a centerfire turkey shoot this last year. 6) Old Business-NRA Rifle instructors are still absent for youth programs. Hoping to rectify that situation this next year. – Reduction of Spotted Eagle remodel project-Motion to close out the patio project at Spotted Eagle, seconded and passed by members. – Drawing for all remaining raffle items and door prizes-List of prizes and winners published and noted. This entry was posted in General News, Meeting Minutes on February 10, 2019 by Jeff Faycosh. This entry was posted in General News, Meeting Minutes on January 25, 2019 by Custer Rod and Gun Club. This entry was posted in General News, Meeting Minutes, Other Events on January 20, 2019 by Jeff Faycosh. This entry was posted in General News, Meeting Minutes on January 14, 2019 by Custer Rod and Gun Club. The Custer Rod and Gun Club will be holding our annual Membership Meeting and Banquet at 6:00 pm on Saturday January 19th, 2019 at the Town and Country Club (S. 4th St. and Eagle Ave) in Miles City. The banquet starts at 6:00 PM followed by the Annual Meeting at 7:00 PM. In traditional CR&GC style, the club will provide roast beef, potatoes, and dinner rolls. Attendees A thru M are asked to bring a salad or dessert, and N thru Z a main or side dish. There will be door prizes and raffle items including a Sig Sauer P365 9mm, a Ruger PC Carbine in 9mm, a Ruger 10/22 in 22LR, a Ruger American rifle in .270 WIN, a Rugar SR90 in 9mm, a S&W M&P Shield in 45 ACP, and MUCH, MUCH MORE! All present with a 2019 paid membership will be entered in the door prize raffle, just for attending. Eligible members must be present to win. Membership renewals will be sold at the door, but if you renew online before the meeting please bring your membership card with you, as the attached stub is your entry for the door prize raffle, and the membership card is required to vote. More prizes are accumulating as we speak. Please keep in mind that the meeting space, servers, and food provided by the club is paid for by the raffles held during the banquet. If you have any items you would be willing to donate to the raffles, please contact Jesse Smith at 853-2556 or email@custerrodandgun.com to arrange for them to be included in the raffles, and picked up before the meeting if necessary. Also consider nominees for board positions that will be expiring and filled during the meeting. Please consider serving your club by serving on the Board of Directors. This year we will be electing three Officers and five Directors. The Officer positions that are expiring are currently held by Jerry Austill (Vice-President), Jeff Faycosh (Secretary), and Marty Scheid (Treasurer). The Director position are currently held by Shane Adams, JD Arneson, Daniel DeLong, Chris Schlepp, and Lee Wankel. All positions are two year terms except Treasurer and the Director position held by Lee Wankel, which will both be one year terms. If you would be interested in serving on the Board but won’t be able to make the meeting, please contact Jesse Smith at the number/email above to have your nomination entered, or to suggest someone else who may be interested in accepting a nomination. – Membership-Renewals are arriving in good numbers. – Spotted Eagle Remodel-progressing slowly, discussion on completing current upgrade and wait further expenditure until trap range is used more. 5) Reports of Boards and Standing/Special Committees-looking at interest in Archery league, needing volunteers and head of Archery committee. Action pistol-if weather holds a winter shoot. – Annual Banquet & Meeting-January 19th-looking for donations which will be held by Jesse Smith, some have been received. The 6 firearms for raffles were arranged, price of tickets and 50/50 drawings, card drawing, volunteer incentive, door prize etc. 8) Nomination and Election of Officers and Board of Directors-Chris to VP, Vince Muggli to Director, other positions currently serving and up for election. One vacant Director is open too with no nominations received yet. This entry was posted in General News, Meeting Minutes on December 30, 2018 by Jeff Faycosh. 1) Call to order and Roll call of officers, Officers present-Jesse Smith, Jeff Faycosh, Marty Scheid, Shane Adams, Jesse Blankenship, Randy Hart and Chris Schlepp, Lee Wankel. – By-laws for signatures was circulated and signed by Board members. – Jesse brought all envelopes and letters to the meeting requiring all board members to label and stuff envelopes for mailing to membership. This entry was posted in General News, Meeting Minutes on December 13, 2018 by Jeff Faycosh. 1) Call to order and Roll call of officers, Officers present-Jesse Smith, Jerry Austill, Jeff Faycosh, Marty Scheid, Shane Adams, JD Arneson, Jesse Blankenship, Daniel DeLong, Jim Keith, Lee Wankel and Chris Schlepp. 3) Reading of Current Financial Report- Marty Scheid provided the following: Current Bank Balance $29,715.24. He identified a CD at Stockman’s Bank maturity date 12/26/18 $2,047.72 currently collecting interest at .3%, CD at US Bank maturity date 07/03/19 $2,306.55 currently collecting interest at 2%. Marty just wrote a check for $60 to Miles City Sanitation for Sunday Creek Range garbage. A safety Deposit Box has been acquired at US Bank, Jesse Smith and Marty Scheid have keys. Post office Box has been rekeyed. Trap club has turned in $38 cash, 21 white tokens and 152 red tokens. Current Token balance is 600 Red member tokens and 108 White nonmember tokens. – Action Pistol-No report-Jackpot shoot was a success with 15 shooter $135 taken in. – Shotgun-during the winter Jeff Faycosh will look at getting league information for spring as well as discount ammunition. – Guns & Prizes for Annual Meeting-firearms were chosen by board members for the meeting raffles 3rd Saturday in January. January 19th. $2,300 approved for purchase of 6 firearms which were picked by the board. Dan motioned, Jeff 2nd passed. – Winter meeting locations-Sptted Eagle in November and December then as weather permits otherwise to VFW. 8) Nomination and Election of Officers and Board of Directors-Jerry Austill will decline and Chris Schlepp accepted nomination to Vice President. – List of Board Members with expiring terms and inquiry of who will accept a nomination for another term-Faycosh accepted, Shane Adams-accepted, Daniel DeLong declined. This entry was posted in General News, Meeting Minutes on November 14, 2018 by Jeff Faycosh. – Financial Report-as provided by Randy Anderson:420 members, 22 life members 398 paid dues, 227 cash ($9080), 171 paid through PayPal ($6,590.34), 4 card replacement fees paid ($100) Total membership deposits from 2018 $15,770.34. Current balance in bank $28,287.40. – Game Cam- Jeff Faycosh will order at a later date. – Action Pistol-Railroad ties purchased and delivered $259.80, targets purchased $99.98 misc supplies $42.76. Proceeds from shoots $1010.00 in addition to $567.41. Marty moved to have the action pistol continue through the month of September and he would head it up. Chris 2nd motion passed. – Audit-no action not done Board members concerned and each took to task to complete. – Trap-$174 received from Trap shoots- Faycosh made a motion to have a female champion trap shooter put on a trap shooting clinic for female shooters in September. Cost was $40 per shooter for a 4 hours clinic, with the club sponsoring the clinic and paying half of the fees. Limited to 10 attendees. Chris 2nd, passed. – Trama Kits-4 received 2 will be at Sunday Creek Range, 1-at trap club, the other will be kept by Jim Keith for safe storage. – Centerfire Turkey shoot-Well attended $30 to the club. Chris Schlepp and Jeff Faycosh conducted the shoot. – Updating By Laws-Article 10 amended to read as follows, motion by Jesse Smith, 2nd by Jeff, motion will be voted on at the next Board meeting. 2) The updated By Laws shall be signed by two-thirds of the Board of Directors and kept in the Club Secretary’s files or other location deemed to be a safe place, as well as posted on the club’s website. -Discussion of replacement of Cheri Reed as Treasurer. Cheri’s current job is keeping her too busy to attend to the job as Treasurer, Cheri has been unable to regulary attend the board meetings. In the past no one has stepped up to take the position so Cheri kept trying to keep up with the task. Marty Scheid volunteered to be Club Treasurer. Marty made the motion, JD 2nd, motion passed and pursuant to the club bylaws Marty Scheid is the new treasurer. Steps will be taken to transfer the accounts so that Marty and Jerry will be signers on the financial accounts. John Reed asked that Boy Scouts would be able to use one pistol bay at the rifle range, and borrow two of the club’s 20 ga. shotguns on Aug. 27th. John Reed will facilitate the activity. Passed and approved. 8) Nomination and Election of Officers and Board of Directors-Motion to replace Marty Scheid with Lee Wankel as director, JD made motion, Chris 2nd Motion passed. This entry was posted in General News, Meeting Minutes on September 16, 2018 by Jeff Faycosh. We have openings for10 ladies interested in a 4 hour shotgun/trap shooting clinic September 22. Cost is $20. Sponsored by Custer Rod and Gun Club. Taught by an award winning female trap shooter. 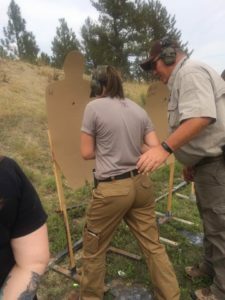 This entry was posted in General News, Shotgun on September 3, 2018 by Custer Rod and Gun Club. Custer Rod and Gun Club will be holding a class on Saturday Sept. 22th in Miles City. This will be an Introduction to Concealed Carry Class, taught by EDC Training LLC. This class is for the individual that may or may not hold a Montana Concealed Carry Permit and is wanting to learn more about the Defensive use of a handgun. This course addresses the effective concealed carry and use of the handguns popular today. The course will address the advantages and disadvantages of the various types, models, configurations and calibers of such Handguns, as well as the most effective support equipment and methods of concealed carry. The program consists of both classroom discussion, and live fire drills on the range. This course introduces the student to techniques applicable to defensive use of the handgun. Emphasis is put on shooting skill development for application in real-life circumstances. The fundamentals of Mindset, Gun-handling, and Marksmanship are covered in lecture while the practical aspects are taught on the range. Other course topics include Situational Awareness, equipment selection, safety, handling, loading, unloading, malfunction clearance, drawing and firing techniques. This entry was posted in General News, Other Events on September 3, 2018 by Custer Rod and Gun Club. This entry was posted in General News on July 30, 2018 by Custer Rod and Gun Club. Please, Pre-Register for the match. This entry was posted in General News on July 20, 2018 by Custer Rod and Gun Club. 1) Call to order and Roll call of officers Present: Jesse Smith, Jerry Austill, Jeff Faycosh, Cheri Reed, Shane Adams, JD Arneson, Randy Hart, Jim Keith, Marty Scheid and Chris Schlepp. – Status of adding VP as secondary signer on financial accounts-Jerry moved to accept amendment as written, 2nd by Chris, passed. VP will be added as signature to the accounts. – Spotted Eagle remodel & mowing-Work day scheduled for June 24 at 9am to paint and mow. – SSL Certificate-not done yet. – LEO demo at rifle range-was approved and took place. Oversight of not being added to previous minutes. new safe area/railroad ties-a Bunk of ties for construction of safe area and range use was approved. Jesse maid motion, Chris 2nd. Chris will pick up from ACE. – Archery-nothing to report Jeff has not yet contacted public entities. – Long Range Shoot-Forms from BLM received and filed 7 people attended $55 in donations received. Second shoot will be scheduled in early fall. – Trap-regular attendance at ladies shoots $132 to Cheri on June 15th. No youth shoots on Wednesday. Friday nights have had a couple in attendance. Camera for vandalism by shooting other than shotguns at Spotted Eagle, Jim Keith made motion, 2nd by Cheri, Jesse will coordinate. – Motion to Amend club By-laws: Jim Keith motioned at the last Board Meeting “To amend the club By-laws, Article IX, Section 2, to read, “A) The Vice-president shall perform the duties of the President in the absence of the President. The Vice-president shall assume the duties and responsibilities of the President should he be unavailable due to death, disability, or resignation. The Vice-president shall be listed as an alternate signer on all bank accounts held by The Club. The Vice-president shall not perform any of the duties of the Treasurer except when requested to do so by the Club Treasurer, or by the Club President. The board of directors will fill unexpired term of the Vice-president until the annual meeting where there will be nomination and election to fill out Vice-president unexpired term at that annual meeting.” The motion was seconded by Jesse Blankenship, and tabled to be voted on at the June meeting of the Board of Directors. Passed Motion by Jerry, 2nd by Chris. – Centerfire Rifle Shoot-Sunday August 5th Chris and Jeff will corrdinate 9am to 2 pm. Chris made motion, 2nd JD and passed. – Miles Muscha, Pheasants Forever Youth trap shoot dates-Cheri made motion, Jeff 2nd passed will use Spotted Eagle trap range 9am-noon on 8-11, 8-18, 9-8, 9-15 will pay for targets Muscha will run range. This entry was posted in General News, Meeting Minutes on July 16, 2018 by Jeff Faycosh.